This is the sort of the headlines that Russian and foreign readers will see in the Russian and pro-Kremlin media after the presidential election in Russia on 18 March 2018. There may also be something like “The European Council on Democracy and Human Rights recognises the presidential election in Crimea”. The name “European Council on Democracy and Human Rights” sounds nice, doesn’t it? “European”, “democracy”, “human rights” – we surely like all these concepts. And the readers will ask themselves: how comes that an organisation with such a nice name has legitimised the vote in Russia-annexed Crimea? They will do a Google search and find the website of the European Council on Democracy and Human Rights (ECDHR), decorated with EU flags, that claims that the ECDHR is “a nonprofit, nongovernmental organization that is supporting democratic institutions and practices around the world” and is engaged in “promotion of the values of European Charter of Fundamental Rights, and the European Convention of Human Rights”. This is, again, very nice, but the readers will then have even more questions. And those will be valid questions, but there is no need to wait until March 2018 to ask them and then seek answers – I will answer them today. Let me go back to 2007. That year, a Polish far-right activist Mateusz Piskorski registered, in Warsaw, an organisation called “European Centre of Geopolitical Analysis” (ECGA). By the time Piskorski registered it, he had already taken part in several electoral observation missions coordinated by the Russian organisation CIS-EMO headed by Aleksey Kochetkov, a former ideologue of the fascist Russian National Union. The CIS-EMO and ECGA, as well as their Belgian partner, Eurasian Observatory for Democracy and Elections (EODE) led by the neo-fascist Luc Michel, would be engaged in the pro-Kremlin efforts through fake electoral observation. In short, they would go to “observe” various electoral processes in Russia and other former Soviet republics and “assess” whether elections there conformed to the democratic principles and standards, that is whether the elections were free and fair, and held at regular intervals on the basis of universal, equal and secret suffrage. The assessments of the electoral monitoring missions of the CIS-EMO, ECGA and EODE would always suit the interests of Moscow’s foreign and domestic policies, and would be used by the Russian politicians and media to relativise the usually sceptical or even negative assessments made by such established missions such as the OSCE and its Office for Democratic Institutions and Human Rights (ODIHR). The ECGA and EODE would cooperate with CIS-EMO until 2011, when Piskorski and Kochetkov parted ways for personal reasons. The ECGA, however, would find another Russian partner, the Moscow-based Civic Control association headed by Aleksandr Brod, who is also, ironically, the head of the Moscow Bureau for Human Rights. The key members of the management of the association are members of, or closely associated with, the Russian parliament (State Duma) and the Civic Chamber of the Russian Federation. When in need of loyal and friendly foreign “observers”, the Civic Chapter would turn to the ECGA and ask Piskorski to build up a team of “monitors” who would then be sent to an “observation mission” and do what is useful to the Kremlin. In March 2014, when the Russian military occupied the Ukrainian republic of Crimea, the Civic Control would contact the ECGA and EODE again and ask them to bring the usual pool of “monitors” to “observe” the illegal and illegitimate referendum on 16 March that would be followed by the annexation of Crimea by Russia. And the “observers” came to Crimea, predominantly members of the European radical right-wing parties (Belgian Flemish Interest, Austrian Freedom Party, Bulgarian “Attack”, French National Front, Hungarian Jobbik, Italian Northern League and Tricolour Flame, Spanish Platform for Catalonia). Quite expectedly, they would say that the “referendum” was legitimate and fair, and that Crimea rightly belonged to Russia. “Observers” of the “referendum” in Crimea followed by Russia’s annexation of this Ukrainian peninsula. left to right: Charalampos Angourakis (Communist Party of Greece); Tatjana Ždanoka (Latvian pro-Russian party For Human Rights in United Latvia); the ECGA’s Mateusz Piskorski; Finnish neo-Stalinist Johan Bäckman; Ewald Stadler; Robert Stelzl; Hikmat Al-Sabty (Die Linke, Germany); Frank Creyleman (Flemish Interest, Belgium); Valerio Cignetti (Tricolour Flame, Italy); Aymeric Chauprade (National Front, France); Enrique Ravello (Platform for Catalonia, Spain); Fabrizio Bertot (Forward Italy). Crimea, 16 March 2014. The Civic Control association was not the only organisation that dealt with the “observers” of the Crimean “referendum”. Among some other Russian officials who organised the Crimean “observation mission” was Leonid Slutsky (pronounced as “Slootskiy”) from the misleadingly named, far-right Liberal-Democratic Party of the Russian Federation led by Vladimir Zhirinovsky. At that time, Slutsky was the Chairman of the State Duma Committee on the Commonwealth of Independent States (CIS), Eurasian Integration and Relations with Compatriots, as well as the head of the Russian Peace Foundation. 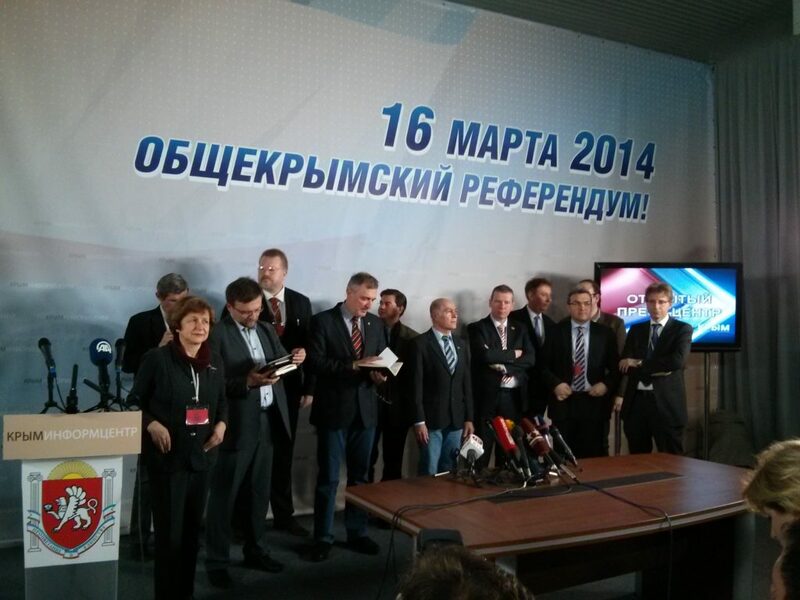 Slutsky brought to Crimea a group of 25 members of the State Duma who did the same what the other “monitors” did, i.e. attempted to legitimise both the “referendum” and its “results”. On 19 March 2014, Slutsky and six other Russian officials were sanctioned by the US. 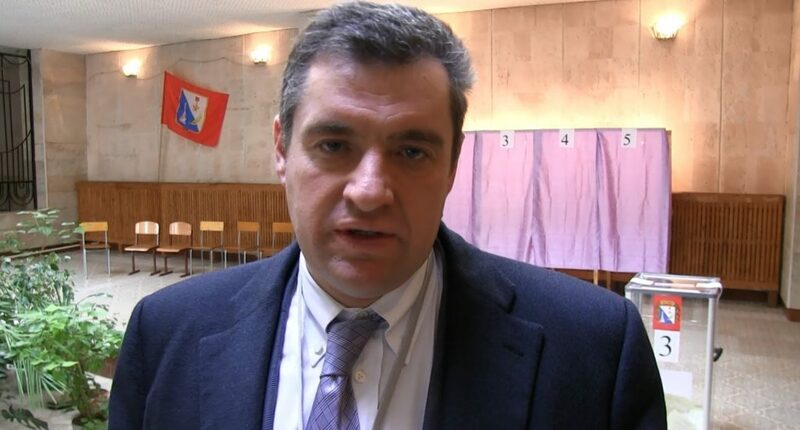 On 2 November 2014, Slutsky would bring Russian MPs to “observe” the “parliamentary elections” in the “Donetsk People’s Republic” and “Luhansk People’s Republic” – East Ukrainian territories occupied by the Russian military. The foreign “monitoring mission” was, again, organised by the Civic Control association together with the Polish ECGA and Belgian EODE. Leonid Slutsky “observing” the “referendum” in Russia-occupied Sevastopol, 16 March 2014. Slutsky would become very active in attempting to justify Russian foreign policy with the help of European politicians. In April 2015, Slutsky brought to Moscow a French MP Thierry Mariani from the centre-right Republicans party and other French politicians who would say that sanctions against Russia had to be lifted. The trip was fully funded by Slutsky’s Russian Peace Foundation (RPF): this helped present Mariani’s trip not as a Russian state sponsored operation (the obvious link being Slutsky’s post in the State Duma), but as a private initiative, as the RPF is formally not connected to the Russian state. In July 2015, Slutsky would send Mariani to Crimea, and the trip, again, was paid for by the RPF. The aim of Mariani’s visit to Crimea was pure propaganda: the EU may have not recognised the “Russian status” of Crimea and imposed sanctions on Russia, but there are European MPs who recognise the “referendum” and suggest lifting the sanctions. 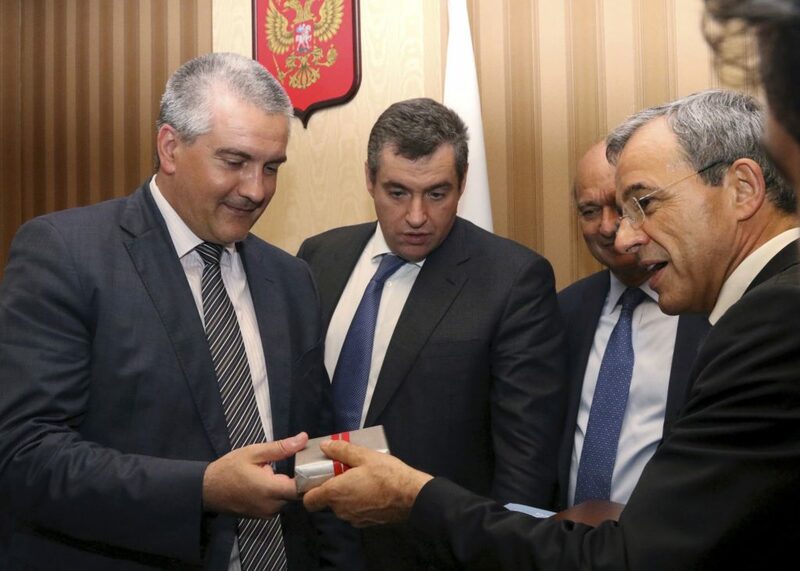 Leonid Slutsky (centre) looks at the gift that Thierry Mariani (right) presents to Crimean “Prime Minister” Sergey Aksyonov (left), 23 July 2015, Simferopol, Russia-annexed Crimea. A visit of the French MPs shows that there exists not only a Europe that wants to oppose Russia, but also a Europe that wants to understand the real mood in Crimea, that realises that there was a referendum and that its results express the will of the people […]. Those who want to cultivate good relations with Russia – and these are not only some politicians, but a great number of French businessmen too – will listen attentively to what Mariani and his colleagues will tell after their return from Crimea. With the same propagandistic aim, Slutsky would most likely facilitate the visit to Crimea of the leadership of the Italian far-right Northern League. At the very least, it was Slutsky who informed Russian journalists, in November 2015, of the Northern League’s plans to visit Crimea. In August 2015, following the “success” of Mariani’s trip to Crimea, Slutsky commented on the words of Polish Eurosceptic and pro-Kremlin politician Janusz Korwin-Mikke who said that he was thinking of visiting Crimea. In particular, Slutsky told the media that Russian MPs were ready to welcome European colleagues, including those from Poland, who would like to visit Crimea. Korwin-Mikke visited Crimea in December 2015, but it is unclear whether Slutsky was in charge of his Crimean trip. In August 2016, however, it was Slutsky and his Russian Peace Foundation that, again, brought Mariani to Crimea. 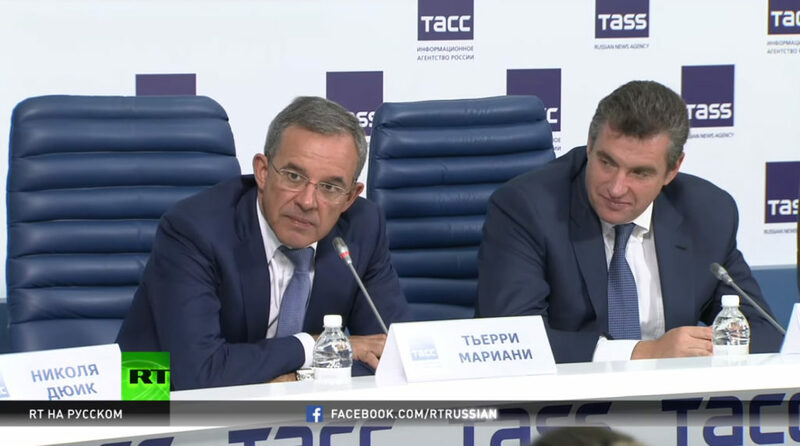 Thierry Mariani (left) and Leonid Slutsky (right) at a press conference in Russia-annexed Crimea, August 2016. Mariani refused to answer the question about the presumed honorarium for his visit to Crimea. Meanwhile, in Poland, the ECGA’s Piskorski founded a political party Zmiana (Change) which combined socio-economic populism, nationalist sentiments and, most prominently, pro-Kremlin ideas. Among the most important members of Zmiana were Konrad Rękas and Kornel Sawiński who also worked in the ECGA and functioned as pro-Kremlin “electoral observers”. In autumn 2015, Ukraine held regional elections, in which the Kremlin supported the Opposition Bloc – an heir to the pro-Moscow Party of Regions of former President Viktor Yanukovych. As Piskorski was sanctioned by Ukraine for his activities in Crimea in 2014, he could not go to Ukraine with his ECGA team. However, a member of Zmiana, Janusz Niedźwiecki, took part, as a coordinator, in the workings of the “electoral monitoring mission” Political Initiative headed by Sergejs Blagovescenskis, who had cooperated with CIS-EMO at the 2010 regional elections in Ukraine and, together with the ECGA and EODE, “observed” the 2012 presidential elections in Russia. “Observing” Ukraine’s regional elections in 2015, the Political Initiative worked in favour of the Opposition Bloc. Niedźwiecki turned out to be a capable pupil of Piskorski and, after “observing” the Ukrainian regional elections, plunged into pro-Kremlin and anti-Ukrainian activities. He became a darling of the Russian disinformation resource Sputnik News that would present him as a “Polish independent commentator”. In November 2015, Niedźwiecki and his colleagues from Zmiana, protested at the Turkish Embassy in Poland following Turkey shooting down a Russian jet that had apparently violated Turkish airspace during Russia’s Syrian campaign. In July 2016, Niedźwiecki accompanied two Polish senators from the liberal-conservative party Civic Platform, Jan Rulewski and Jerzy Wcisła, who went to Ukrainian city of Odessa to meet with the representatives of the Opposition Bloc in an attempt to slam the Ukrainian post-Yanukovych authorities. In August 2016, Niedźwiecki and another member of Zmiana, would accompany Korwin-Mikke on his trip to Chechnya. And in November 2017, Niedźwiecki took part in the congress of the pro-Kremlin National-Bolshevik movement “Essence of Time” founded and headed by Sergey Kurginyan. Janusz Niedźwiecki (left) and his colleagues from the far-right Zmiana party at a pro-Kremlin protest by teh Turkish Embassy in Warsaw, Poland. In May 2016, however, Zmiana received a painful blow: its leader Mateusz Piskorski was detained by the Polish Internal Security Agency presumably on the charges of cooperating with the Russian intelligence services. That, in particular, meant that Piskorski’s ECGA became inoperative and could not coordinate “electoral monitoring missions” anymore. And so Niedźwiecki jumped at the opportunity and registered, in March 2017, his own “electoral observation” organisation called “European Council on Democracy and Human Rights” (ECDHR) which mimicked – in order to appear respectable – the name of the ODIHR: Office for Democratic Institutions and Human Rights. In September 2017, when the Russian authorities held regional elections, Niedźwiecki’s ECDHR made its first appearance as a coordinator of foreign “electoral observers”. Around 27 people, including Thierry Mariani, “observed” elections in different Russian regions and the annexed Crimea. 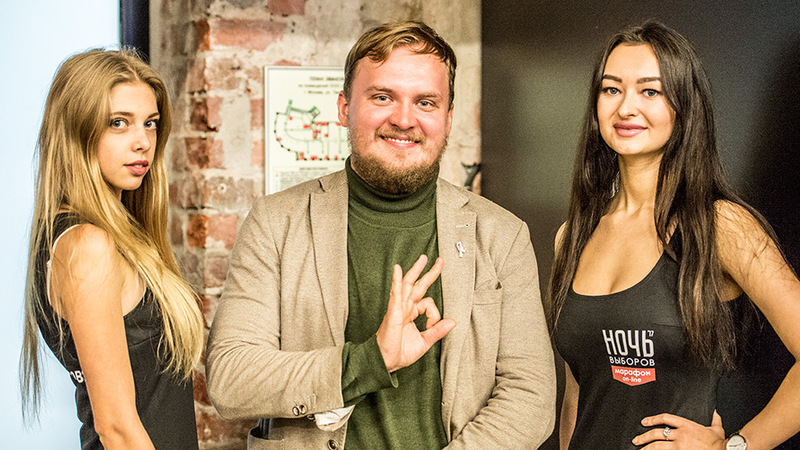 It is unclear whether all of them were invited to Russia by the ECDHR, but we do know that Pavel Gamov, then a member of the far-right Sweden Democrats party was invited to “observe” elections by the ECDHR. Moreover, Gamov said the same invitation had been sent by the ECDHR to all members of the European parliamentary group “Europe of Freedom and Direct Democracy”, which is known for its Euroscepticism and of which the Sweden Democrats is also a member. Pavel Gamov of the far-right Sweden Democrats party as an “independent observer” at the regional elections in Russia, September 2017. In December 2017, it became obvious that the Russian authorities will face some difficulties at the presidential election scheduled for March 2018. In particular, the ODIHR and European Union stated that they would naturally not send any observers to Russia-annexed Crimea At the same time, Slutsky, who had replaced Pushkov as the head of the State Duma Committee on Foreign Affairs in October 2016, declared that Russia would not be inviting observers from the Parliamentary Assembly of the Council of Europe that had suspended Russia’s voting rights following the annexation of Crimea. Hence, Russia will face the problem of legitimacy of the presidential election not only in Crimea, but also in Russia. We are counting on the arrival of foreign, international observers from a range of international organisations, including the OSCE, CIS [Commonwealth of the Independent States], SCO [Shanghai Cooperation Organisation] and others, as well as our colleagues from many foreign countries. The CEC will be inviting the Asian association of election organisers, Latin American structures, and European ones. We will be inviting the World association of election organisers. The strategy of the Russian authorities is to relativise to negative assessment of the presidential election by the most reputable monitoring organisations (ODIHR and the European Union) by inviting loyal international “observers”. Moreover, the Russian authorities need to find those “monitors” who will go to Crimea. At the end of December 2017, the “solution” seemed to have been found: according to Slutsky, MPs from European national parliaments will monitor the voting in Crimea. The Russian media report that the list of the invited foreign observers includes MPs from Austria, Germany, Italy, Poland, Slovakia, Finland, France, and Czech Republic. The Finnish website Yle partly confirmed this information, saying that at least five Finnish MPs from different parties, including Mikko Kärnä of the liberal Centre Party, were invited to observe the Russian presidential election. But even more importantly, Yle revealed that the person who invited Finnish MPs to Russia was no other than the Niedźwiecki. 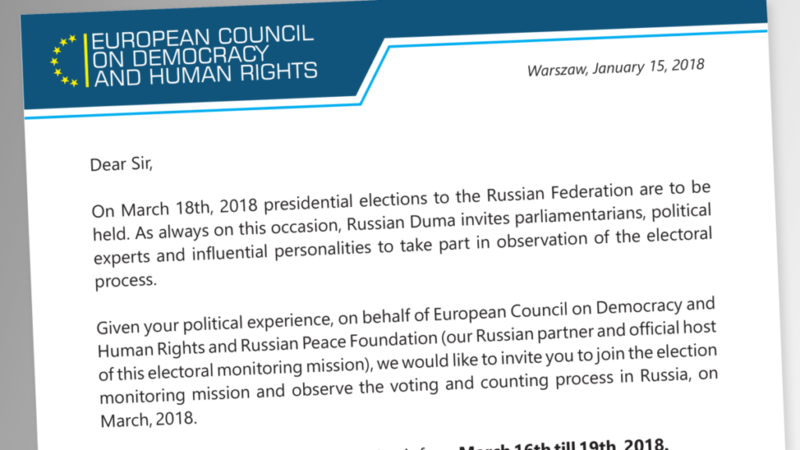 Moreover, Niedźwiecki invited them on behalf of both the ECDHR and Slutsky’s Russian Peace Foundation that Niedźwiecki described as “our Russian partner and official host of this electoral monitoring mission”. As he also added, “all travel and accommodation expenses” will be covered by the “organisers”, which implies the Russian Peace Foundation. In his invitation, Niedźwiecki mentions that they would be inviting “around 150 parliamentarians, politicians and experts from all around the world”. The same number of “observers” is mentioned in the Russian media, with a reference to the sources in the State Duma and CEC. A snippet of the ECDHR’s invitation sent to Finnish MPs on 15 January 2018. More than 100 European MPs may have received such a letter. All this means that Leonid Slutsky, the head of the State Duma Foreign Affairs Committee, uses his pocket organisation Russian Peace Foundation as a cover for the state-sponsored fake international observation of the presidential election that, as all the Russian officials know, will be rigged. And Slutsky is doing this with the help of the Polish pro-Kremlin organisation that has a nice, respectable name, but also a long history and rich legacy of fake electoral monitoring. These are not some pro-Russian politicians. We are talking about people who have experience of monitoring elections, are competent in terms of the law, and know voting technologies.